I am travelling to the Antwerp area via Dover-Dunkirk for work next week. This will be followed by another work related visit near Manchester. I thought I could cut the driving time by using one of P&Os routes to Hull. I have never been on any of these crossings and I would like some tips. Which is the best option? Sailing from Rotterdam or Zeebrugge? What time boarding starts? Is it worth opting for the packages advertised on the website? Rotterdam has bigger, more modern boats. The Zeebrugge ones are ok. Boarding at Rotterdam generally starts around 17:00 for a 20:30 approx dep. One main benefit of Rotterdam is that you'll arrive into Hull earlier and won't have to contend with the lock, so you'll be off and on your way around 8am hopefully, the Zeebrugge ones can be closer to 9.30 or 10 before you get off. The following applies to both routes: In terms of packages. Its slightly cheaper to pre book food. The Brasserie and main restaurants are both good. If you want a club cabin I'd chance your luck on board as it's cheaper by far to upgrade that way. Thanks for your replies. My appointment in Manchester is set for 11am so this should give me plenty of time. I think I will opt for the Rotterdam option. If you book one of the standard fares you get a 2 berth premier outside cabin and your breakfast in with price. The Zeebrugge two are IMO more appealing as ships - there's something intangibly unsatisfying to me about the current Rotterdam pair but on the other hand they are more modern and it shows. The Zeebrugge ones were originally quite smart and there's still bits of that left amongst layers of generic P&O tat, especially in the upper lounges. The buffet can be a bit of a bunfight and is, in my view, of middling quality. It fills a hole but little more and the restaurants on all four ships are, as I suppose you'd expect, altogether superior. As mentioned, getting through the various arrival checks by car can be painful. And with the greatest respect to the good people of the East Riding, naming a road which often moves at a snail's pace after the great Clive Sullivan is unwittingly ironic. Beyond that, as feat of construction the M62 was a heroic endeavour so let that thought amuse you as you queue your way over to the rainy side of the Pennines. I thought about doing something similar on our recent trip, with P&O, going one way via Calais and coming back from Zeebrugge. However what put me off was the fact that the Zeebrugge route appears to be every other day at the moment and also the P&O website doesn't seem to allow you to go out on one route and return via another, you have to make two separate bookings. For me the Belgium ships have a similar feel to Oscar Wilde, maybe it's the era? I agree with your observation of the Rotterdam pair, very formulaic and lack the same welcoming ambiance plus you've the hike to the stern if you want any fresh air. Not my favourites along with the Harwich twins. Thansk for the advice. 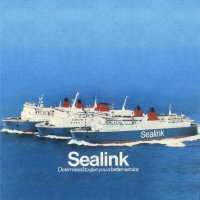 I will opt for the Rotterdam Hull option with a standard package. It includes a premier outside 2 berth cabin. The cabin prices are higher than with BF by quite a margin. For example, a 2 berth inside is £98.00 with P&O instead of £43.00 with BF. I like the Zeebrugge pair a lot and i think they compare very favourably to the ships I've sailed on in the current BF fleet (PA and MSM). We sailed out to Zeebrugge last year and returned via Rotterdam. There are a few more facilities on the larger boats but we preferred the old pair. An 11am meeting in Manchester could be a push though, so I would opt for Rotterdam in this case.